We all know that beer is the best when it is cooled, so we need beer refrigerators. These units are specially designed for cooling beer, so they have features and additions that ordinary refrigerators simply don’t have. Even better, there are a lot of different models on the market, but keep in mind that just some of them are the best, so they should be taken into account – let’ try to find the best beer fridge! Let’s take a closer look at the top rated appliances I could recommend and try to select the best beer fridge! The refrigerator in question is the best when it comes to cooling beer. It is made from stainless steel, so it is incredibly durable. Even better, the front door is made from glass, so you will be able to look at the beer, while it is cooling. It has 3 shelves and can accommodate up to 120 cans. The thermostat that regulates the temperature is completely mechanic, so it is very durable and it can be used to determine the temperature between 43 and 57 F.
The door can be opened on the left or on the right, which maximizes the practicality. The interior lights will come on as soon as you open the door, so this refrigerator actually comes with some amazing features that are simply said, great. In addition, the door come with a key, so you can lock it and protect the content. Simply, one of the best beer coolers for sale right now. If you are looking for a refrigerator that is simple the best, when it comes to cooling the bottles, this model is the best. It has been based on the latest technology, and it is made from stainless steel, so it can last for a long time and it is more than resistant. The best part of this model is the fact it comes with two zones. One of them can cool between 56 and 66 F, while the other between 46 and 66 F.
The LCD is a standard feature and it is more than just useful as well. It can display the temperature of both zones, so you will be able to know the exact temperature anytime you want. The door is made from glass as well, so this refrigerator looks modern and a lot better than similar models on the market. NewAir AW-281E 28 Bottle Thermoelectric Wine Cooler is a great choice for cooling beer as well. This model is available in different sizes, so it can accommodate different number of bottles. It ranges between 12 and 33 bottles, so you can get the model that suits you the best. It is also made from stainless steel and glass, so it will fit perfectly in any home. Even better, it has a compact size, so it won’t occupy a lot of space. Due to the fact it has been designed for home use, this refrigerator is very quiet, so you won’t hear a thing while it is operating. Beside the attractive design, this model comes with an LCD display, so you can monitor the temperature of your drinks. It is designed to be easy to use, which makes it a great choice if you don’t have experience with these refrigerators. In addition, choosing the desired temperature and adjusting it is incredibly simple. You can’t go wrong with this device when looking for best beer fridge. Haier 12-Bottle Dual Zone Curved Door with Smoked Glass Wine Cellar is the latest addition to the market. This model looks amazing and has a completely different design than all models you can find at this moment. It is based on the latest technology as well, so it comes with the latest features. It has 2 zones (46-66 F and 54-66F) so it can be used for different types of drinks. Even better, it comes with two LCD touch displays, so it is easy to use and adjust the temperature. WHY DO YOU NEED BEER COOLERS? If you like beer and you like it cool, you are going to need beer refrigerators. They can cool any type of drink much quicker than ordinary refrigerators and they are energy efficient. All models on the list are based on the latest technology, so they are modern and practical. The best part of beer refrigerators are the doors, simply because they are made from glass, so you can enjoy looking at the beer, while it is cool. At the same time, these models are practical, so they occupy a very little of space and they are easy to use. Most of them come with simple controls and LCD displays, so using them is even simpler. 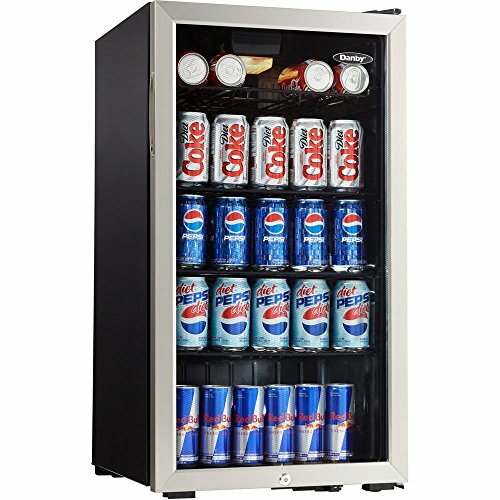 If looking for beer coolers for sale I’d recommend buying one online (I can recommend Amazon.com as I order there a lot of stuff and I’ve never had any problems). That is made from stainless steel. These refrigerators last long and they are resistant to smaller issues that can damage it. That is quiet. Due to the fact it is going to be used in a home, it is mandatory to be quiet and not to make any sound at all. The design. Although, this isn’t the mandatory factor, it is more important than you may imagine, simply because you can improve the interior of the entire home, if a beer refrigerator looks amazing. Has two zones. This feature allows you to keep two drinks at different temperatures. It is mandatory if you want to cool down another type of drink, beside beer, so it is more important than you may think. At the same time, these models are bigger and can be used for different applications. Has an LCD display. This additional makes the entire refrigerator better and more interesting, but at the same time, it makes it easier to use and adds style to it. Keep in mind that if you are getting a model with 2 zones, you are going to need two LCD displays, simply because they are simpler to use and they look better. A large capacity. No matter if you are looking for a model that is going to be used for smaller amounts of beer, it is recommended to get a unit with the biggest capacity, simply because it can accommodate more beer, so if you need more of it, you can cool it down in a matter of minutes. Still too hot? See our guides on buying best portable ice maker and best kegerator or cheap kegerator. Rapid drink chillers are a blessing, especially during summer when living in areas affected by harsh heat waves. See video below and check out this page if you want to learn more on how those devices work. Beer refrigerators are a great addition to any home, simply because they are affordable, made from durable materials and they are packed with the latest features. In any case, they are more than just useful and they are compact, so they won’t occupy a lot of space. On the other side, they can make the entire home look better and stylish. Previous articleCheap And Small Kegerator – Which One To Choose?